The Minister of Planning, Dr. Nouri Sabah al-Dulaimi, received on Monday 18/03/2019 Dr. Mustapha al-Hiti, head of the reconstruction fund for the areas affected by the terrorist operations and his accompanying delegation. During the meeting, he discussed the efforts of local and international teams to restore recovery and reconstruction in Liberated areas. 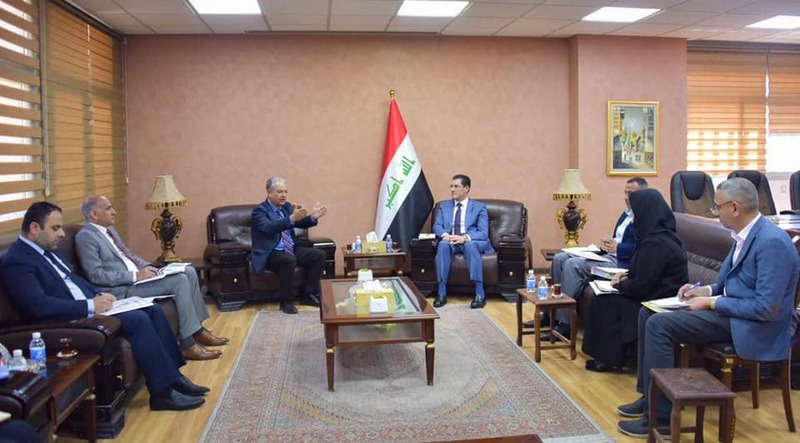 Dr. Nouri al-Dulaimi stressed the importance of continuing the efforts to increase the number of vital projects in the liberated areas and unifying all local and international efforts to overcome all challenges facing the implementation of these projects. For his part, Dr. Mustafa Al-Hiti presented a review of the projects being implemented and what will be started during the current year. He expressed his sincere appreciation for the directives of the Minister of Planning during the meeting and his supporting efforts, stressing the active contribution of this support in the implementation of more projects in the sectors of health, education and municipal services.